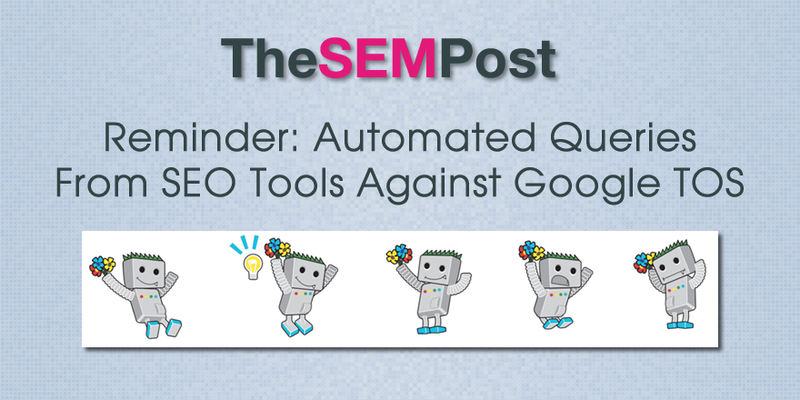 Gary Illyes from Google has another reminder that using tools or services that send automatic queries to Google – such as to check rankings or indexing – are against the Google TOS. Periodically, new tools that get released will run up against Google’s terms of service (and against the terms for Bing as well, and probably many other search engines too). And it seems that a new SEO tool released this week is doing the same. It is against Google’s terms of service, but it is also against Google’s Webmaster Guidelines too. Google’s Terms of Service do not allow the sending of automated queries of any sort to our system without express permission in advance from Google. Sending automated queries consumes resources and includes using any software (such as WebPosition Gold) to send automated queries to Google to determine how a website or webpage ranks in Google search results for various queries. In addition to rank checking, other types of automated access to Google without permission are also a violation of our Webmaster Guidelines and Terms of Service. Now, the violation of Webmaster Guidelines is an interesting thing – it actually wasn’t in there when Google wrote the original, but it has been there for many years now. But there are many old school SEOs with stories to tell about using WebPosition Gold and subsequently getting banned by Google for those sites they were using it on, however, that was fifteen or so years ago, and I am not aware of any other tools resulting in Google taking that extreme action. So if you have tools that scrape Google for data, you could get hit for something, but it would likely only be either a temporary IP ban or the tool breaks. When it comes to SEO tools that scrape data, such as those that track rankings or features on a larger scale, most/all are in violation of this. But they use enough randomized IPs for data scraping to prevent Google from being able to track their tool’s queries. Related, John Mueller also asked for clarification if the tool honors robots.txt and if it abides webmaster guidelines – presumably the same automated queries issue. Someone from the company later said it uses a Google API, looks for the results in the search results, and that it doesn’t use scraping. It could be using the Google Custom Search API.